There was a time when travel by sea was the fastest way to travel from continent to continent. Those voyages by boat were often fraught with difficulties caused by the limitations of only being able to access whatever resources crews loaded with them in advance. Technology has come a long way since those days of perilous sea journeys. Now, most of the time travelers can get where they need to go by plane, even if it’s to the other side of the world — and they can get there within hours. These days travel by sea is reserved to a few commercial uses, such as deep sea fishing or certain kinds of freight, or to leisure-lovers on cruises. Even with as far as technology has advanced, ships continue to face some of the same challenges resulting from having to take all their resources with them. This can be a practical conundrum, as well as very resource-costly. To run the generators on cruise ships and power their propulsion, the average large ship can burn through 80,000 gallons of fuel per day. That’s 250 tons, which is no small amount of weight to carry on board. This fuel load also comes with pollution problems. 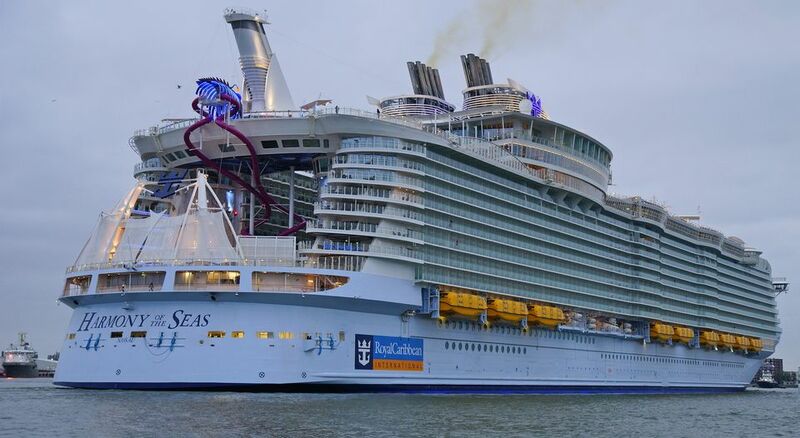 The Harmony of the Seas, the world’s largest cruise ship, burns around 66,000 gallons of high-pollutant diesel fuel each day. In case you’ve been wondering about the sheer amount of power all that fuel is creating: the Carnival Triumph creates enough power to fuel 60,000-70,000 average homes. Although that power provides travelers the kinds of comforts that they have grown accustomed to on cruises, it can become the opposite of comfortable when it fails. The Triumph suffered a fire five years ago that left it crippled, running on bare necessity backup power as it struggled into port. In addition to the obvious discomfort of losing air conditioning, lighting, food cooling and most entertainment options, being at sea without power can be hazardous in case of passengers with medical needs that require consistent electricity. It also leaves ships at risk of losing navigational tools and other essential operating tools. Is there any way to solve the issues of fuel consumption, pollution and safety hazards from electrical failure all at once? WigL’s answer is yes. WigL wireless power technology has the ability to affix satellites with transmitters. Those transmitters could broadcast power to receivers aboard cruise ships. Although hybrid-style electric cruise ships are already underway, that process would be massively accelerated and streamlined with the ability to send power directly to the ships. Transforming cruise ships’ power systems to electric would mean burning significantly less fuel, which would lighten the cruise ship, and lighten its impact on the environment. Passengers would no longer have to worry about losing basic amenities and power for life-saving health devices. Cruises could be longer with fewer challenges, which might ultimately even bring the price tag down. If you’re intrigued, it’s time to find out more about how WigL wireless power is ready to transform the way you stay powered up!